Stream the Niki Zarrabi Artist Channel. View her works also on the Abstract channel. Niki Zarrabi is a mixed media artist from Atlanta, Georgia. 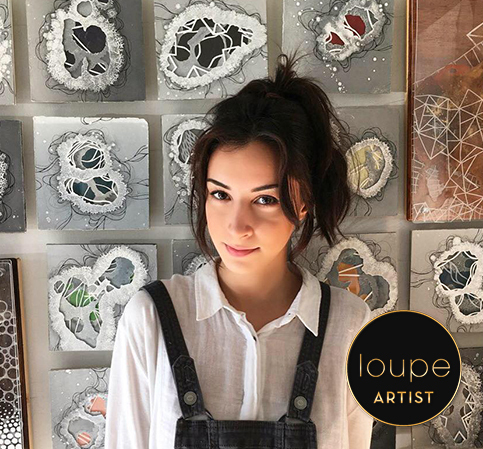 She received a Bachelor in Fine Arts with a Concentration in Drawing and Painting from Georgia State University in 2014. Her work explores the complex relationship between spirituality and the science of human existence. She uses art to study the structure of our universe as a means to understanding its sustenance. By recreating the delicate infrastructures of biology in her layered pieces, Zarrabi is abstractly interpreting her own understanding of our existence. Her goal is to provide her audience with an alternate perception of the countless, fragile yet complex elements that come together in order to give us life. I'm interested in capturing the idea that every living cell in all the history of time has been recycled from the same elements, passed on to new life from old life. I want to capture that connection between all of us and all living things. Science does not negate spiritual connectivity; it enhances it.